Djokovic and Nadal have played 49 times so far with a 26-23 H2H advantage in favor of Djokovic prior to their scheduled 50th meeting today. Their rivalry is one of the greatest in the history of tennis and especially the Open Era. This rivalry took a form of its own after 2010 when Rafa-Roger rivalry had practically run its course. Until the end of the 2010 season Nadal dominated the rivalry with a 16-7 H2H in his favor, the tables however turned thereafter with Djokovic winning more of those battles and has in fact won last eleven of twelve between them. 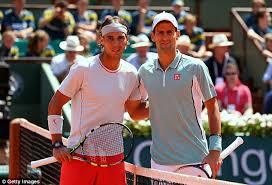 They have not only met in all slams but also in 4 consecutive slam finals and over 20 Master Series matches. Their meetings have produced master pieces such as the 2012 Australian Open final and 2013 French Open semi-final. Their playing styles are somewhat similar with both playing from the base line, looking to grind the opponent down and constructing points rather than attempting to end them quickly. Nadal is way better than Djokovic at volleying and approaching the net but rarely makes a trip to that region, whereas Djokovic’s game, it seems, was honed to surpass or outdo Nadal’s and not, like Roger’s, counter it. Until the arrival of post 2010 Djokovic it was quite unimaginable that someone, and least of all Novak with his breathing and during-match retirement issues, would be able to outrun Nadal on the court but Djokovic has been giving Nadal lessons on “how to stretch points and outrun Nadal” over the last 5 years. If Nadal can play closer to the base-line and approach the net whenever possible then he would put enough pressure to easily handle this error-prone version of Djokovic. However, Nadal still has the tendency to stand 10 feet behind the base line when pushed and Djokovic, with all his experience, just might be able to push Nadal enough to win his 8th consecutive meeting against him. This match with Nadal, we feel, could either help Djokovic regain his lost form and confidence or damage it further to stall any chances of its recovery during the clay season in the very least. Therefore, this match is as open as the view from the top of Mount Everest, so let’s all sit back and enjoy some thrilling rallies with inhuman stretches and gets and superhuman shot making abilities from the baseline. ← What’s up with Murray? Djokovic should win this in 3 sets. Nadal will be haunted by 7 consecutive losses to him and that can be tough to overcome. Fast clay,7-0 win in a row to ND, Novak’s time to prove doubters wrong as of his form, Nadal’s slower form than at MC and Bracelona- those are all factors in Djokovic odds to win. I say,COULD be. Whatever,a match out of this world in terms of attraction. Its disappointing that both of you were totally wrong, but we’re talking about nadal on clay,you know nothing about tennis. What’s so disappointing? Novak is the only player to beat Rafa consecutive times on clay and defeated Rafa in straight sets at RG. It took a huge dip in Novak’s form for Rafa to finally break the losing streak. Really huge dip, ok but i said that my disappointment was about their delusion that inspite being in bad form, djokovic will beat nadal and they both were very confident.And nadal hasn’t been in very form for much time(barring 2017), so you can in a way say nadal wasn’t in good form but Novak defeated him on clay but right now the thing is nadal’s dominant display on clay. Why do Nadal apologists claim that all of Rafa’s losses to Novak were because he was not in form? Sounds a little arrogant. See, nadal was good in 2011, but hadn’t reached the level he did in 2010, and that all started with 2011 ao, i accept that djokovic was the best player at that time but nadal even though he reached 3 finals that year, appeared distorted and bit erratic and as nadal said himself that his problem on 2011 was Novak djokovic and not injuries but surely he wasn’t at his peak, if you want to see nadal at peak watch 2013 season, or 2010 and 2008. And i see i was right nadal did beat him up in Madrid quite comfortably. What’s so disappointing? Novak is the only player to beat Rafa consecutive times on clay and defeated Rafa in straight sets at RG. It took a depowered Novak for Rafa to finally break the losing streak. Nadal will win in straight sets, no doubt about it. Djokovic’s level is not there yet, not physically not mentally. On the other hand, Nadal is confident and with the shots he’s making there is not a single reason why Djokovic should win. How about 11 reasons Novak will win? He has beaten Rafa 11 of their last 12 meetings and their last 7 straight. The only other player in this tournament who has taken a set from Rafa is Fognini. He is a dangerous player who has beaten Rafa three times and clearly gives him doubt and trouble. He pushed Rafa to three sets here and in Miami. Novak is a far superior threat who holds an overwhelming mental block over Rafa and has figured out how to neutralize Rafa’s game. Novak will finish the job Fognini started! Sure the old Djoko could win this, but not this year’s Djoko. Physically he’s not in top form, that’s a fact. Mentally he’s even worse, Rafa’s mentality and stamina and form are (at this moment) far superior than Djokos’. I’ll hear you at the end of the match. Rafa was impressive – pity Novak did not put up stronger resistance.